In this solo cooking adventure, Gary takes a Bittman recipe and adapts it a little more to his liking. Here at Foodie Call, Kate and I practically worship at the altar that is Mark Bittman. And why the heck not? His recipes are simple (okay, minimalist) yet delicious, often shedding the mysticism some dishes hold in our minds (I’m referring to his chicken liver pâté recipe). His recipe for spaghetti with broccoli rabe and garlic, while not exactly mysterious or exotic, was certainly tasty and simple in the “why hadn’t I thought to do that” sorta way. That’s what makes him Marc Bittman, he of the many cookbooks and NY Times columns, and myself decidedly not him. I’ve made the recipe several times, sometimes straight up as Bittman intended and sometimes by varying the type of pasta used or adding meat (face it, I’m such an omnivore that I would turn a nice vegetarian recipe into one that is not). Regardless of what I’ve done to the original recipe, this has become, in all its forms, a staple in my repertoire of go-to meals. In fact, I’m fairly certain I’ve made this over a dozen times in the year or so since I watched the podcast in which he made this and I saw just how ridiculously easy this recipe was. In keeping with the minimalist nature of this recipe, my adaptation only features one change and one addition. After trying this recipe several times with spaghetti, penne, ziti, rotini, and fusilli, I finally settled on fusilli as my pasta of choice. 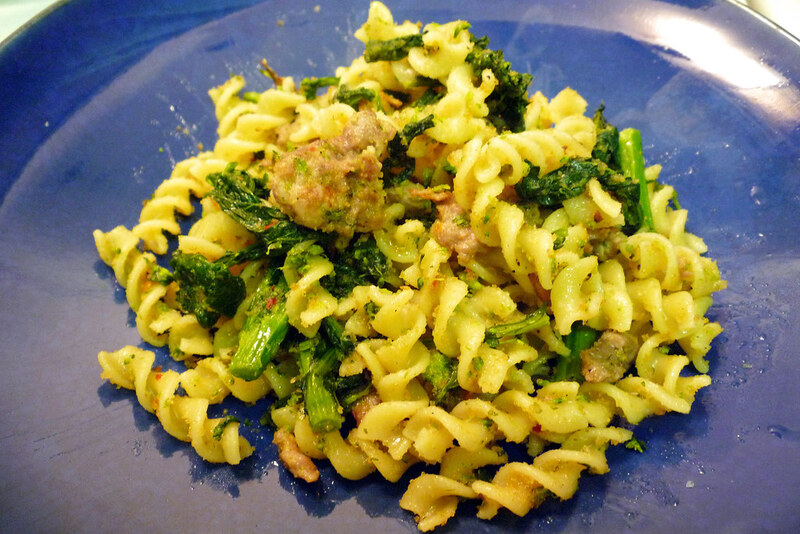 It has a large amount of surface area for the bread crumbs to cling to and the broccoli rabe is chopped into pieces similar in length, which just looks nice on the plate. The addition I made was to add bulk spicy Italian sausage because I loves my meat and the additional dose of spiciness doesn’t hurt either. Besides those two changes, nothing is really different – it’s still awesome delicious and still simple to make. Bring a large pot of water to a boil and salt it. Cook broccoli rabe in boiling water until it is soft, about 5 minutes. Remove, drain well and chop into 1-½ pieces. Cook pasta in same pot. Put the ¼ cup olive oil in a large skillet over medium-low heat. When oil is warm, cook garlic just until fragrant, 1 to 2 minutes. Add bread crumbs and red pepper flakes and cook until bread crumbs are golden, 5 minutes or so. Remove and set aside. In a large pan over medium-high heat, cook the Italian sausage. When it is just about cooked through, reduce the heat to medium-low and add the chopped pieces of broccoli rabe. Toss well to combine, adding salt and black pepper to taste. 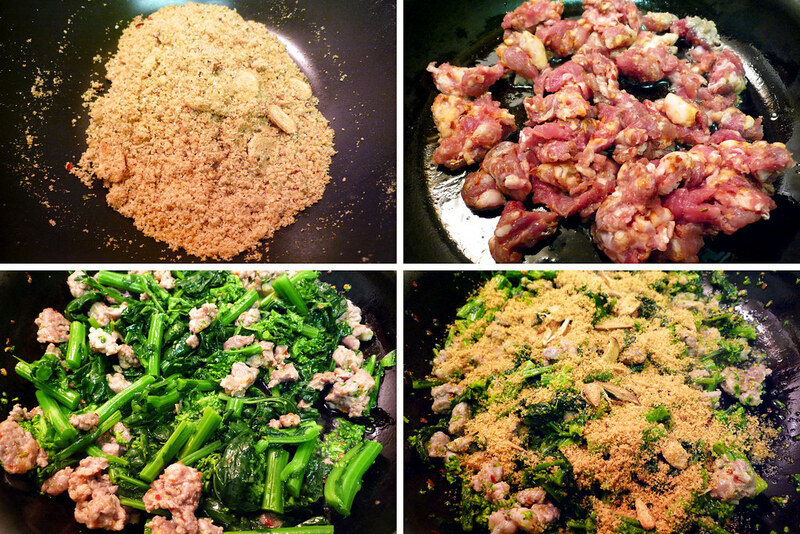 When the broccoli rabe is warm, add garlic and bread crumbs and mix well. When pasta is done, drain it, reserving a little cooking water. 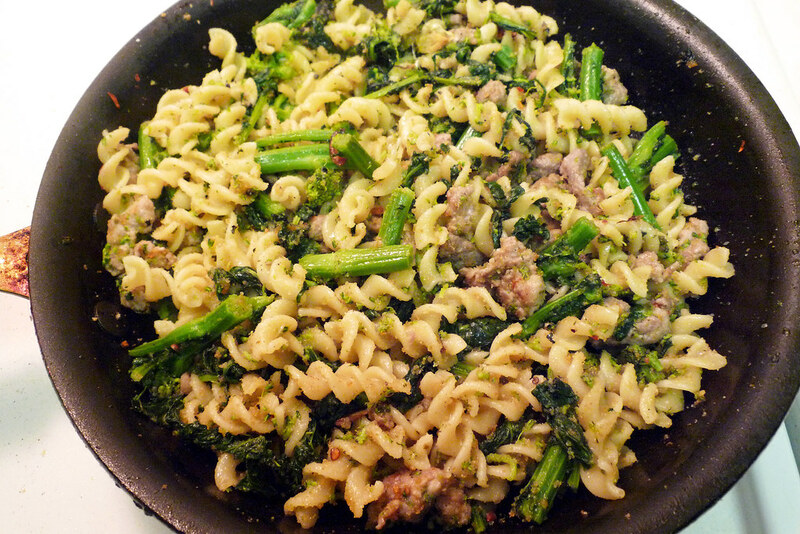 Toss pasta in skillet with broccoli rabe and sausage mixture, moistening with a little reserved water if necessary. Adjust seasonings and serve.